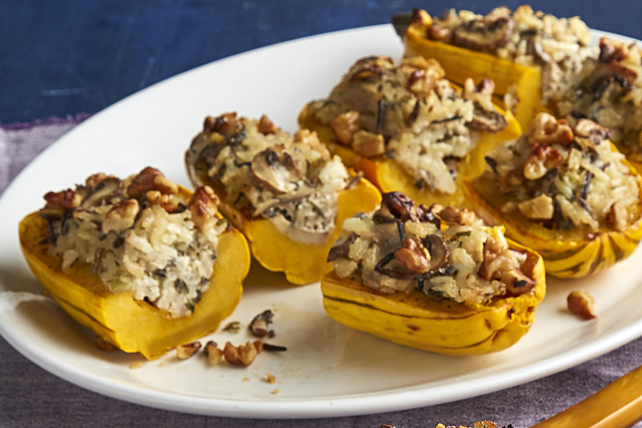 Perk up your menu with our Wild Rice-Stuffed Delicata Squash. This baked squash recipe, made with long grain and wild rice, mushrooms, celery and walnuts, makes a delectable side dish. Cook rice as directed on package, omitting the butter. Meanwhile, pierce each squash in several places with sharp knife; place on double layer of paper towels. Microwave on HIGH 5 to 7 min. or until squash is tender; cool slightly. Heat oven to 400°F. Cut squash lengthwise in half; scoop out and discard seeds. Place squash, cut sides up, in 13x9-inch baking dish; brush evenly with 1 Tbsp. of the dressing. Heat remaining dressing in large skillet on medium heat. Add mushrooms and celery; cook 4 to 5 min. or until tender, stirring frequently. Add cream cheese product and rice; cook and stir on medium-low heat 2 to 3 min. or until cream cheese is completely melted and mixture is well blended. Spoon into squash halves; sprinkle with nuts. Bake 20 to 25 min. or until squash is tender and filling is heated through. The skin of delicata squash is thinner than that of other winter squash varieties, making it edible like the skin of summer squash. Prepare using 175 g (3/4 of 250-g pkg.) Philadelphia Brick Cream Cheese, cut into cubes, and stirring 2 sliced green onions into the cooked vegetable mixture along with the rice.